I occasionally get all dressed up and go to an historical dance ball. Most such events are Regency period, but some acknowledge the earlier Georgians in costumes as well as country dances. All, understandably, emphasise enjoyment rather than authenticity so far as the dancing goes (although, sometimes, the reverse seems to be true for the costumes). 18th-century balls were formal and elaborate affairs. I can’t help wondering whether it would be possible to get closer to them than our modern historical balls generally do. What was an 18th-century ball like? The most detailed and often-quoted description comes from Pierre Rameau’s treatise Le Maître a danser, published in Paris in 1725 and translated into English by John Essex just a few years later. 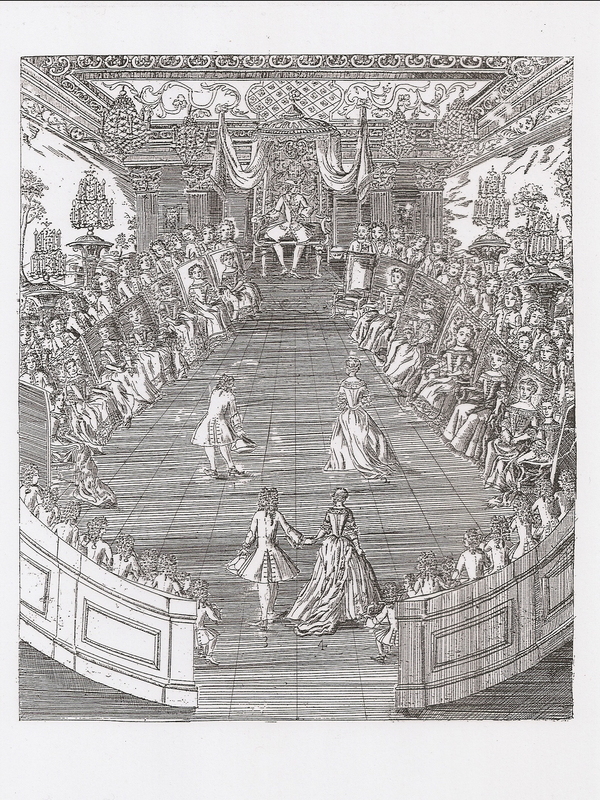 Rameau describes a ball at the court of Louis XIV ‘to which … all private Balls ought to be conformable’. At the French court, everything was ordered by rank. The ball began with branles and gavottes, line dances, led by the King and highest ranking lady. These were followed by minuets, performed one couple at a time in order of precedence. Rameau says nothing about the other danses à deux, specially choreographed duets that use the steps explained in his treatise, or about contredanses. He seems to be writing about the most important and formal court balls, where most of those present were spectators. Masquerade balls, with their elaborately disguised participants, were extremely popular. These followed the same basic programme as the formal balls, with the addition of danses à deux and contredanses. The most lavish masked balls also included danced divertissements, often involving professional dancers. Today, that would be a great way to show off some of the surviving choreographies – if there were enough enterprising and talented people to perform them. John Essex translated Pierre Rameau’s account of royal and ‘regulated’ balls without significant change, suggesting that the form and order of dancing was much the same in England. Balls were held to celebrate royal birthdays, as well as on Twelfth Night and many other occasions. What evidence there is about the dancing at court comes mainly from newspaper reports. According to the Weekly Journal or British Gazetteer for 4 June 1720, the formal ball held to celebrate George I’s birthday that year ‘began about Eight, and the Musick and Dancing (by order) ceas’d at Twelve’, when the King and other members of the royal family departed. There are few references to what was danced, although the Daily Advertiser for 3 March 1731 provides a glimpse of the ball held to celebrate Queen Caroline’s birthday. The ‘set Dances’ were presumably country dances. Dancing into the small hours became customary once the younger members of the royal family began to participate in court balls. One place to attend ‘regulated’ balls was Bath. John Wood’s A Description of Bath (1765) summarises proceedings at the ‘Publick Balls’ held in the city on Tuesday and Friday evenings. The country dances went on for about an hour, after which there was a break for refreshments (Wood refers to ‘Tea’) and then the country dances resumed until the ball closed with appropriate ceremony. The ‘Bathonian King’ was, for many years, Beau Nash. So, an authentic Georgian ball should begin with about two hours of minuets, danced couple by couple, before it can turn to country dances. Such a programme is unlikely to prove popular with modern would-be historical dancers. Yet, it would surely be possible to begin with two or three couple minuets, together with some minuets for four (which became part of the opening sequence of minuets at the less exalted balls). The rest of the evening could then be given over to country dances – hopefully played at speeds that allow for steps of the period rather than simply walking through the figures. Of course, to be true to the 18th century, one would have to be able to heed Lord Chesterfield’s advice to ‘dance a minuet very well’. Later in the 18th century, cotillon balls became the rage. I will take a look at them later. This entry was posted in Ballroom Dancing, Country Dancing, The Minuet, Thinking about Dancing and tagged Baroque Dance on May 22, 2015 by moiragoff. I recently began to learn the Viennese waltz. I am a newcomer to ballroom dance, but it seems very different to the modern ballroom waltz. I couldn’t help wondering about its history. I have been told it is earlier than its modern counterpart, but how far back does it go? How does it relate to the early 19th-century waltz I was dancing just a few weeks ago? The early 19th-century waltz raised another question. How does it relate to the minuet? The waltz step we used seemed to share the rhythmic characteristics of the French minuet step (called ‘One and a Fleuret’ by the dancing master Kellom Tomlinson). The man steps onto his left foot and does a quarter-turn pirouette in the first bar, followed by three steps in the next bar (the waltz, like the minuet, is in 3 / 4). The woman does the opposite. Of course, the couple revolve in a clockwise direction, while travelling anti-clockwise around the ballroom, quite unlike the minuet with its serene floor patterns and its fixed front. This waltz was in a hold which was obviously moving towards the modern ballroom hold. The waltzes (French, sauteuse, jetté-sauteuse and German) described by Thomas Wilson in his 1816 treatise seem very different both in steps and hold. So what was going on? How was the waltz developing and changing during the 19th century? Where does the Viennese waltz fit in? I’ve also been struggling with Argentine tango. At the workshop I went to recently, we were taught a small number of basic steps, and told that these were all we needed to dance tango – everything else was derived from them. My mind immediately flew both to baroque dance and to modern ballroom and Latin. Don’t they all rest on just a few basic steps, which can be joined together, varied and decorated in all sorts of ways to produce an extensive and rich vocabulary of movements? Modern ballroom and Latin dances, as well as Argentine tango, are social dance forms intended for the ballroom, and all are improvisational – like the 18th-century minuet. Modern dances for the stage, or for competitions, have fixed routines – just like the baroque ballroom and theatrical choreographies. Thinking about the different ballroom and Latin dances, with their various shared vocabularies of steps and their very different musical and stylistic qualities, my mind jumped again to baroque dance and its several dance types. These also share the same steps but are otherwise distinct, musically at least. I am wondering whether being able to grasp the differences between the modern waltz, the foxtrot and the quickstep, and between the rumba and the cha-cha, might help me as I try to differentiate the saraband, the loure, the bourée and rigaudon? The differences between all these dances might seem obvious (at least to the initiated), but they can be hard to interpret in performance unless one is an expert. So, is all this dancing divisible into ancient and modern, where never the twain shall meet, or is it all actually variations on a shared theme? This entry was posted in Ballroom Dancing, Thinking about Dancing and tagged Baroque Dance, Latin American Dance, Modern Ballroom Dance on January 18, 2015 by moiragoff. In Britain early dance has tended to keep itself to itself. There are some links with folk dancing, but relatively few with the wider dance world. Some forms of dancing have even occasionally been viewed with hostility. I have to admit that I’ve also been affected by these attitudes. I’ve recently been working on baroque dance with dancers trained in different styles and it has been very rewarding. As a ballet and baroque dancer, who has spent many years focussing on just those two styles, I’ve also recently begun to branch out into other forms of dance. I really wish I’d done this much, much earlier! I’ve wondered for quite a while how to attract ballet dancers into baroque dance. These two styles should be a marriage made in heaven, as baroque dance is really the earliest form of ballet and the foundation of its style and technique. It isn’t as easy as that of course, not least because the relationship between early and modern ballet is complex. I recently did a short course in Spanish classical dance (escuela bolera). I’ve wanted to try this for a long time, and I was really glad I’d seized the opportunity. For the uninitiated (of whom I am one) it seems like a cross between ballet and flamenco. As a ballet dancer, I found I could cope reasonably well and I enjoyed the challenge of unfamiliar steps and arm movements. Escuela bolera has lots to offer baroque dance, for Spanish dance forms (including the playing of castanets) were very influential in France in the late 17th and early 18th centuries. As Spanish classical dance is also a historic style, some of the baroque steps would surely be of interest. I know that others have pursued this cross-over, but it has never filtered down widely into British early dance. I’ve also been dipping my toes into modern ballroom and Latin American dance. I’m finding these dances very difficult, as both the partnering and the steps are miles outside my dance experience and hence my comfort zone. I can’t readily see a connection between these and 18th-century dances (though there must surely be one between them and the couple dances of the 18th and early 19th century). However, good ballroom and Latin dancers can surely bring a sense of performance as well as technical skill to earlier dance forms. They can also challenge our perceptions and understanding and so help with the process of change and development. How can we attract them into early dance? This entry was posted in Thinking about Dancing and tagged Baroque Dance, Escuela Bolera, Latin American Dance, Modern Ballroom Dance, Spanish Classical Dance on April 5, 2014 by moiragoff. Dancing is hard. Even country dancing needs practice if it is to be enjoyed by dancers and onlookers. Baroque ballroom and stage dances require training, as well as a great deal of practice and rehearsal. How can we recognise bad dancing? Poor technique, unstylish and unmusical performances, dancers who ignore each other and are unmindful of their audience, dancers who simply don’t enjoy dancing – any one of these can make for bad dancing. More than one almost certainly does. Dancers of 18th and early 19th-century choreographies come from a variety of dance backgrounds. Some have no dance background at all. Just like dancers in other genres, they need to be aware of their level of skill and be prepared to work to improve it. I am not going to draw attention to particular performances that I think are bad. I would much rather concentrate on those I think are good and try to analyse what makes them so. However, I do want to foster greater awareness of the different levels of skill and the constructive criticism that will raise standards among performers of these dances from history. Dances from the 18th and early 19th centuries are worth the best performances we can give them. That is how we can share and enjoy them, among ourselves and with the wider world.